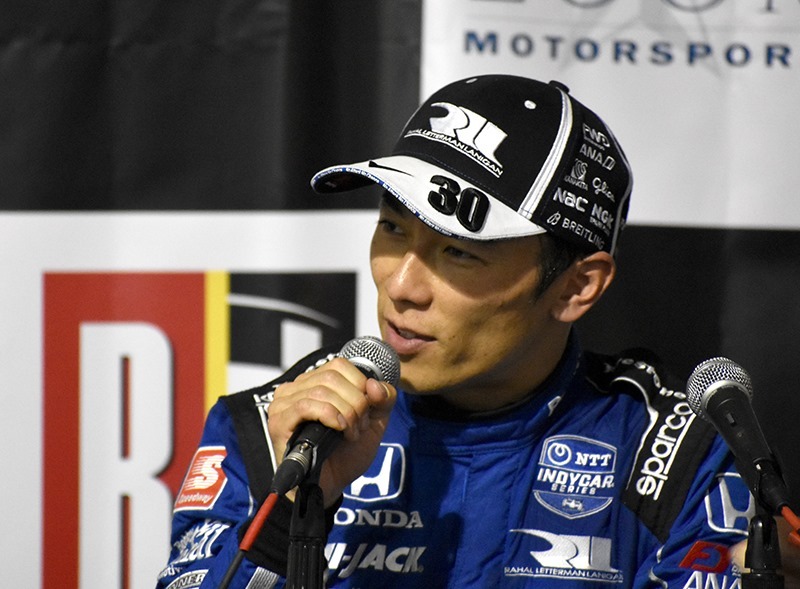 In a bit of a surprise, Takuma Sato took the pole position for tomorrow’s Honda Indy Grand Prix of Alabama. It is the thirty-first time that a Rahal Letterman Lanigan Racing driver has won the pole, going back to the days of Rahal/Hogan Racing in 1992. Teammate Graham Rahal will join him on the front. The last time that Bobby Rahal’s team swept the front-row was at Chicagoland in 2005, when Danica Patrick and Buddy Rice swept the front row (and RLL driver Vitor Meira starting third). As the clock for the Firestone Fast Six had already hit zero, and it looked as if Rahal was going to win the pole. But Sato nipped Rahal on his last lap and took the pole. It was an interesting Fast Six. Five different teams occupied the Fast Six. Aside from the two RLLR drivers on the front row, the next two rows consists of Scott Dixon (Chip Ganassi), James Hinchcliffe (Arrow Schmidt Peterson Motorsports), Sébastien Bourdais (Dale Coyne) and Spencer Pigot (Ed Carpenter). If you’ll notice, there were no Penske or Andretti drivers in the Fast Six. Before qualifying, the big debate was whether or not Team Penske had been sandbagging all weekend. I wasn’t sure. They had obviously struggled in the three practices, but we had seen similar struggles at St. Petersburg and they proceeded to win the pole and the race. But early on in qualifying, it was obvious that Team Penske was really struggling. According to Steve Wittich at Trackside Online, this is the first time that Team Penske has been shutout of the Firestone Fast Six since Long Beach in 2015. The highest starting spot for a Team Penske driver goes to Will Power, who will start seventh. Simon Pagenaud will start fourteenth and the defending race-winner, Josef Newgarden, will start sixteenth. It’s not any better on the Andretti side. Alexander Rossi is the top Andretti Autosport driver and he is eighth on the starting grid. Ryan Hunter-Reay will roll off in eleventh, Marco Andretti will start thirteenth and Zach Veach’s nightmarish start to the season continues as he starts twenty-third in a twenty-four car field. There were two rookies in the Top-Ten. Colton Herta will start ninth and Santino Ferrucci starts tenth. As for the other rookies, Felix Rosenqvist and Patricio O’Ward start seventeenth and eighteenth respectively. Marcus Ericsson will start twentieth and DragonSpeed’s Ben Hanley will start twenty-fourth. All of that shuffling from the usual suspect and there was no rain. The skies were darkening as qualifying wore on, but so far – we’ve not seen a drop all day. The radar doesn’t look so good for tonight, but they are still optimistic that we will have no rain during the race. I will go off on a small rant that some of you have heard before. I don’t know who is responsible for this, but it still needs to be addressed. Each year at Barber, we sit in the grandstands over in the Fan Zone to watch qualifying. Each year, the same thing happens. The crowd sits and watches the first two rounds of qualifying. But there is a pause between Round Two and the Firestone Fast Six. Almost automatically, the crowd gets up to leave thinking qualifying has ended. The row in front of us started to file out and I asked one guy “You know it’s not over don’t you? They still have to run for the pole”. He looked at me with a dumbfounded look on his face and said he thought it was over. They sat back down. But I’ll bet two-thirds of the stands emptied before the Firestone Fast Six was run. I don’t know if the track, IndyCar or the Advance Auto Parts Network being played over the PA bears the responsibility to inform fans how qualifying works, but they are not getting the message. Perhaps they think the second group of Round One is Round Two and that Round Two is actually the end. This is the only track where we sit in the stands for qualifying. We are usually in the pits, so it probably happens at other tracks too. But the word on the basic rules of qualifying is not getting heard. End of rant. That will do it for us today. The three of us took in Rusty’s Barbeque last night and were generally underwhelmed. Tonight, the plan is to go eat Cajun food at Pappadeaux (much to Susan’s dismay). However, we tried going there last year and it was a two hour wait. Hopefully, we can get in quicker tonight. Again, we will be here early tomorrow – even though the race starts later than usual. Coverage starts at NBCSN at 3:00 CDT and the green flag flies around 3:15, so plan accordingly. But we will be here early. I’ll post first thing tomorrow to give a weather update and a general feel for the crowd and the buzz going on around the track. Check back then, and thanks for following along with us so far this weekend. This entry was posted on April 6, 2019 at 6:15 pm and is filed under IndyCar. You can follow any responses to this entry through the RSS 2.0 feed. You can leave a response, or trackback from your own site. this reminds me of the very first NHL ice hockey game i attended. after the second period “we” and “i” thought it was over and left. to enjoy something new. make it easy to come back again. It’s not just you. It feels wierd watching on TV also. I had the volume way down and the 2nd group of the first round throws it all off. Especially with the commercial breaks you don’t have in person. There’s GOT to be at least some narration at the track at least. George – Any update on the condition of the Sweeper & its driver? Looks like they hung their left front wheel off the track surface. Several times at Long Beach, sitting in stands to watch qualifying and follow the constant changing of the qualifying order on a large video screen, I’ve seen couples and groups amble up the steps of the temporary stands, loaded down with pricey race track food and drink, and settle in to watch and gorge — with just two minutes to go in the Fast Six session. To me, that’s like going to the concession stand at a movie theater two minutes before the closing credits roll. Maybe it’s just me … or maybe they’re actually arriving early for the Robby Gordon Stadium Super Trucks … and if they ARE stadium truck fans, or IMSA fans (as I am), let them know what is going on with ostensibly the main event. Whatever, I agree that fans sometimes need to be told clearly what the schedule of events is. What they do with the information is certainly their business … but maybe something like social media posts throughout the day could remind people what is going on now and what is soon to happen. Many don’t seem to understand the story line or process of a race weekend. The series and the tracks can’t MAKE people pay attention (I’ve eaten in some of the restaurants within the confines of the circuit and seen people who buy a GA ticket and spend the entire day in the several bars — which is their right), but maybe it could be easier for them to follow what’s going on. shouldn’t the track announcer explain the qualifying process both before and during the event? couldn’t Indycar maybe pass out flyers to qualification day attendees that simply explains the process? hoping for sun today george, or at least the very briefest of rain. That would be my guess. I’ve never been a fan of splitting Q1 into two groups like they do, F1 manages to get all cars out in Q1 with no overcrowding problems. But it also seems like a pretty simple thing for the track announcer to let everyone know the final round of qualifying is about to happen and not to go anywhere.